Last September during Open House weekend, I decided I would like to visit somewhere with a river connection, so I went to see the House Mill on the River Lea in Stratford. It’s the largest remaining tidal mill in the world, and next to it is also the Clock Mill, which you can’t visit. 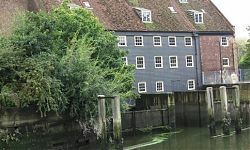 Although the House Mill was built in 1776, in medieval times the place was known as Three Mills, and mills were recorded there in the Domesday Book. It stands on an artificial island built by driving wooden piles sheathed in iron into the mud. 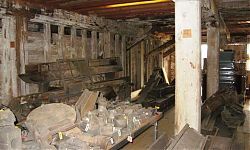 At its height, the mill had 4 large wheels driving 12 pairs of millstones, of which the 4 wheels and 6 millstones survive. They milled grain for flour and also for distilling; the mill operated until 1941. I had an excellent tour of the building – check out their website for tour times. The River Lea Tidal Mill Trust hope eventually to restore some of the machinery, to demonstrate grinding and generate some hydroelectric power. One of the most fascinating things I saw on the tour was the pattern store. 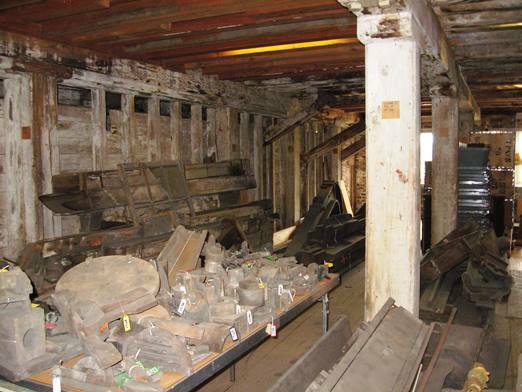 In order to be able to replace machine parts quickly, they kept wooden patterns for all the metal parts, 3000 in all. Then they could cast and replace parts whenever they needed to. How did the mills work? Basically, there needs to be some sort of reservoir behind it, in this case the river inlet. When the tide is rising, the sluice gates are opened and the tide fills up the reservoir. At high tide, the sluice gates are closed, and the water can be let out in a controlled way to turn the mill wheels. 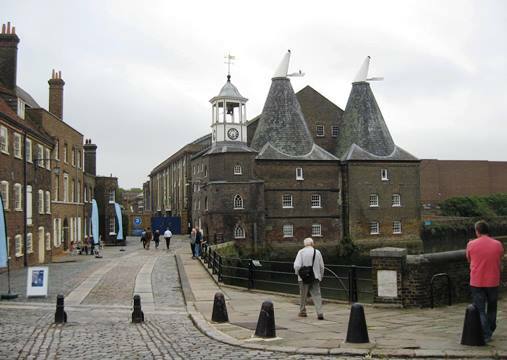 In 1938, the mills operated for 7 to 8 hours every tide, but probably in medieval times only for 3 to 4 hours. We tend to think of mills being to grind flour, but they were also used to grind malt, pigments, gunpowder, and, as I know from the River Wandle, snuff. They were also used as a power source for making paper, for dyeing and fulling cloth, for sawing and in iron manufacture. Windmills are a later development, and floating mills in rivers were not used in England in the middle ages, though by the 16th century there were floating mills at Queenhithe and on the south end of London Bridge. So my next question was…. How many were there on the Thames and where? 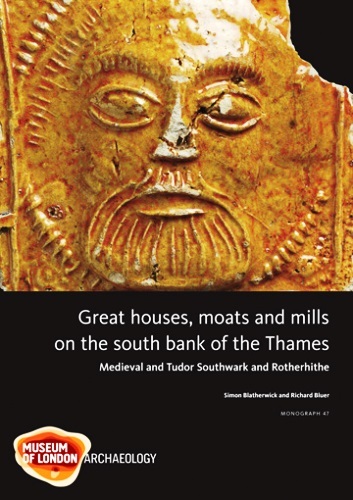 A part of the answer was provided by Great houses, moats and mills on the south bank of the Thames. This is not an easy read! Their historical research suggests that by the 13th century there was a string of tidal mills on the south bank, many in the area roughly where the GLA building is now. The Hospitallers had two on Horsleydown, and Battle Abbey owned two to the west of those. In the area of the excavations there were two pairs. The pair belonging to Malling Abbey was on the very edge or just outside the excavated area, they were there before 1240, and had ponds and ditches stretching back as far as where Tooley Street is now. To the east of these were Dunley’s mills, one built by 1249 and a pair by 1270. Two moated manor houses were built in in this area in the 14th century, and in the 15th century both were acquired by Sir John Fastolf to build his own large house. He pulled down Dunley’s mills in 1446, but continued to lease out the other two. What other mills were there? 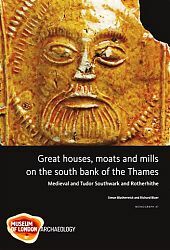 The port of medieval London describes a tidal mill on the east side of the River Fleet in the late 12th century. Milne also says that in the early 14th century, tidal mills were built at either end of the southern wall of the Tower of London, where the moat discharged into the river. Imported unfinished quern stones were found with the Graveney boat and at Three Cranes Wharf. 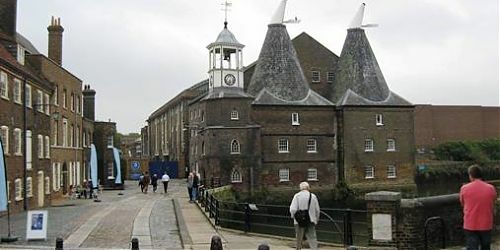 Substantial remains of a 12th century tide mill were found in Greenwich recently and Stuart Rankin’s “Rotherhithe then and now: History Walk 3” says there was a flour mill on the line of West Lane, the boundary between Rotherhithe and Bermondsey, and the millpond was not filled in until 1902. It is still remembered in the name of the Millpond Estate. It’s worth remembering that millponds and inlets for mills continued to be very useful as a source of water for various industries after the mills themselves had gone. I’m going to speculate that the Bermondsey area may have been particularly suitable for tidal mills, because there were lots of natural channels between the eyots. But obviously a moat would also do, if it was open to the river and tidal. According to Wikipedia, there were about 76 tidal mills on the Thames, though they include the two on London Bridge, and are not very specific about the date they are talking about! I am hoping that FROGs will be able to tell us of other tidal mills, or more details about any of these.